Windows 10 Disk Management is a built-in tool which can be used to create, delete, format, extend and shrink partitions, and initialize a new hard drive as MBR or GPT. Windows 10 is the latest Operating System (OS) released by Microsoft. It improves much compared with Windows 8 such as adding the Start Menu seen in Windows 7, a virtual desktop system, a voice assistant named Cortana, Xbox app and streaming, and Edge browser. Create, delete and format partitions. Change drive letter and paths. Explore partition to view files. Initialize a brand new disk before you can use it. Convert empty MBR to GPT disk, and vice versa. More about partition hard drive Windows 10. Maybe most of Windows 10 desktop and laptop users have come across the problem of low disk space, especially for system partition. With Disk Management in Windows 10, you can reduce the influence of low disk space in some ways. 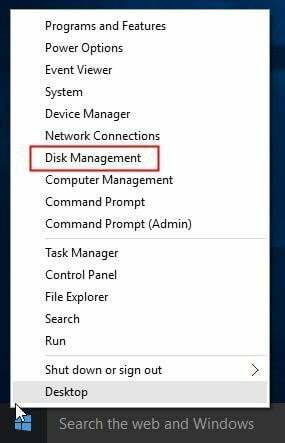 To use this tool, you should know how to open Windows 10 Disk Management, so we introduce 3 ways for you. 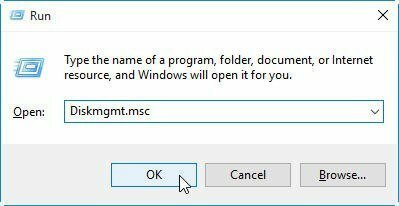 Way 1: The easiest way to open Disk Management in Windows 10 is from computer Desktop. Right click on Start Menu (or press Windows+X hotkey) and then select "Disk Management". Way 2: Use Windows+R hotkey to open Run window. Then type "Diskmgmt.msc" and click "OK" or hit "Enter" key. Way 3: Directly type "disk management" in the Search box and choose "Create and format hard disk partitions" from the results. After you open Disk Management, right click the partition you would like to expand and then choose Extend Volume (e.g. C partition). When you use Windows 10 Disk Management to extend a partition, sometimes you may find the Extend Volume option is grayed out. Is there something wrong with this tool? No, the reason is that the function of Extend Volume in Windows 10 is only available when there is contiguous unallocated space behind the partition you would like to extend. What can you do when you don't have unallocated space on hard drive? Fortunately, the third-party disk partition software - AOMEI Partition Assistant Professional allows you to extend partition whether or not there is unallocated space next to the partition you plan to extend. What's more, you can even enlarge partition without unallocated space on hard drive. The following will show you 2 methods to extend partition with Partition Assistant. You can merge one or more parts of unallocated space into a partition. "System Reserved" partition could not be merged. If there is running applications in the partition you are going to operate, AOMEI Partition Assistant will suggest you to close them or perform the operation under PreOS Mode. If there is no unallocated space on the disk, please go to Method 2. Step1: Download AOMEI Partition Assistant Professional, install and launch it. Right click on the partition you need to extend (e.g. C Drive) and choose Merge Partitions. Step2: Tick the checkbox before the unallocated space and then click OK.
Step3: Now you can preview the unallocated space has been added into C drive. To save the change, please click Apply button at the top left corner. If there are four primary partitions on a MBR disk, and you want to split one of them, the partition that is being split will be converted to logical partition automatically. If one disk has four primary partitions, the program would not allow you to split the system partition or boot partition, unless you could convert one of other partitions from primary to logical partition, and then the program will allow you to split system partition. The new generated partition will be automatically set as logical partition. Step1:Open this software, right click a partition which has enough space (here is D partition) and then choose Allocate Free Space. Step2: Enter the size of free space you would like to add into another partition (here is C drive), and then click OK.
Step3: Now you can preview some free space has been allocated to C drive from D partition. Click Apply to save the changes. Then you will extend partition C.
From the table, you can see AOMEI Partition Assistant Pro is more powerful than Window 10 Disk Management. Besides, it is more freely for you to any operation without losing any data. Therefore, as a user who requires many advanced features, AOMEI Partition Assistant Pro is a good choice. How to Solve Extend Volume Greyed out in Windows 10?